32 Interesting Ways to Get to Know Your Class This Year [via Twitter] - Creative Google Docs presentation with pictures & examples for a range of grade levels/ages. You don't have to do this on the first day, either. Education Buzz Blog Carnival: Back to School 2011 Edition! 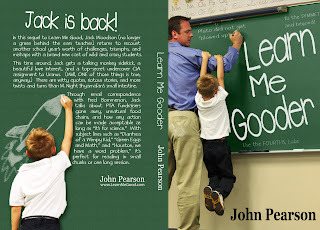 Friend of the blog John Pearson celebrates the release of his new book in Learn Me Good: The day is here! posted on Learn Me Good. Nancy Flanagan presents The Five Million Dollar Demonstration posted at Teacher in a Strange Land, noting "So what was that Save Our Schools March thing about, anyway?" Michail Spiliopoulos presents How to memorize information more efficiently preparing for exams (Part 1) posted at Brain superiority...Boost your brain power!!!. Includes links to parts 2 & 3. Darren presents Teacher Suspended For Blog Post Back On The Job posted at Right on the Left Coast: Views From a Conservative Teacher. Would you want your kid in this teacher's class? Would you want to be in it? Would you even want this person as your colleague? I'd have to say no to all three. Jennifer Bardsley presents Afterschooling, a Definition posted at Teaching My Baby To Read. Joep de Graaff presents Dumbing down posted at Dancing Crocodile, reflecting on our increasing reliance on technology to do our thinking for us. siobhan curious presents Should We Bid Farewell to the Academic Paper? posted at Classroom as Microcosm, noting: "This post was featured on the front page of WordPress.com last week and got a whopping 167 comments - why not add yours to the conversation?" The ringmaster of this carnival, Carol Richtsmeier presents Back-to-School, Top 5 Dream Killers & Educational Polyjuice posted at Bellringers. Danette Schott presents Asperger Syndrome: What Teachers Need to Know :: Help! S-O-S for Parents posted at Help! S-O-S for Parents. Rachel presents Getting Freshman Off to the Right Start posted at High School Ed Help. The geniuses at adaptive software maker Knewton explain How to Make an Interactive Lesson Using YouTube on Knewton EdTech blog. This is one of the most exciting posts I've read in quite a long time. I didn't realize how simple it is to create what is basically a choose-your-own-adventure series of videos. Jennifer Barnett posted a list of ideas for High-Tech Teaching in a Low-Tech Classroom on EdWeek's Teacher Leaders Network. Shelly Blake-Plock of TeachPaperless tells us I Am Not A Great Teacher, knowing that admitting you don't know everything is a pretty important idea in and of itself. 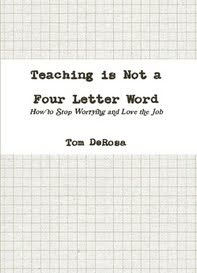 Tom Schimmer reads my mind and makes an eloquent argument about the fallacy of penalizing students (or not even accepting) late work in Enough with the Late Penalties! Steve Wheeler gives us Seven reasons teachers should blog on Learning with 'e's. No argument here! Jay Dolmage shares ideas for students to write about their personal, family and cultural Food Rules on Bedford Bits: Ideas for Teaching Composition. Sometimes I wish I taught some kind of writing course, but then I remember the nonsense around standardized testing. Katie Hellerman shares Top Five Fastest Ways to Improve Your Teaching on The Teaching Game. Can't really disagree with any of them. Liz Dwyer, Education Editor of GOOD, reports on exciting times in science education in Who Runs the World? Three Girls Sweep Google's Science Fair. Texas teacher Mrs. H shares an all-too-common story about anxiety before the first day of school in And the Nightmares Begin, posted on Math Tales from the Spring. Finally, I had to share the wisdom of Seth Godin in Is your anger killing your art? from Seth's Blog. That concludes this edition. Submit your blog article to the next edition of education buzz using our carnival submission form. Past posts and future hosts can be found on our blog carnival index page. After two years of working in education outside of the classroom, Monday was my first day back as a full time teacher. The last week has been a whirlwind as I furiously made final preparations on my room and first day materials and then dove into the first few days of classes. Part of me felt confident in my experience heading into this week, but a much larger part of me was worried that I had simply forgotten too much of what I had learned while on my two-year hiatus. Teaching in a new district and school was hard enough (even as someone who's done it many times over the years) without feeling that I might be reverting into a first-year teacher again. In other words, I don't want to get to the end of the school year and realize I had repeated tons of mistakes I had already made and corrected in years previous. With a couple of days under my belt, my confidence is slowly rising. 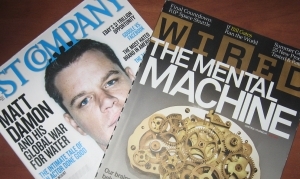 Along with deep reflection and physical digging into all the materials I've collected and created in my career, I've also found myself having to reread things that I shared here. Perhaps that's the best way for me to move beyond my past failures and become a better teacher than I've ever been. I hope you will find something valuable as you prepare for the first few days of school as well. iHomework Keeps Track of School Assignments and Due-Dates [Lifehacker] - A good idea in theory, but as a commenter pointed out, why not just use Google Calendar for free? iPhone App Simulates Teen Dating Abuse [Mashable] - This one is really intriguing. Must-Have iPad and Smartphone Apps for Educators: Revised Edition [The 21st Century Principal] - A slideshow with plenty of recommendations. The 5 Best Math Apps for the iPad, iPhone & iPod Touch [via Twitter] - A list designed for kids aged 5-12. I just heard about a great contest being held by office/school supply maker Avery. Nominate your school, rally as many people as you can to vote for it, and your school could win big! The top 5 schools will receive "$10,000 in Avery school supplies, $1,000 in Bonus Box Tops for Education and an additional $1,000 in gift cards for teachers to purchase additional school supplies. The next 25 vote-getting schools would win $500 in Bonus Box Tops for Education. The contest ends September 16." That means you have about a month to get your school voted to the top of the list! Sign up or get more information at http://www.avery.com/giveback. Participate in the Next Education Buzz Blog Carnival, Hosted Here! Next Wednesday, August 24th, I'll be hosting the upcoming Education Buzz blog carnival. I've hosted many education-related blog carnivals over the years, and I'm excited to participate for the first time in a while. For the uninitiated, a blog carnival is a curated collection of blog posts on a specific topic, submitted by readers (and writers). For those who submit, it's a great way to promote your own work, great work by others that deserves attention. For those that read the carnival, you'll ideally find new blogs to follow and resources to use. Submit here before Sunday 8/21 at 5pm central. 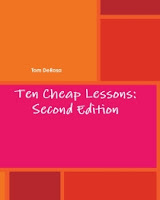 Friend of the blog John Pearson, who in 2006 published a (slightly) fictionalized version of his first year as a 3rd grade math teacher, Learn Me Good, has written a sequel! 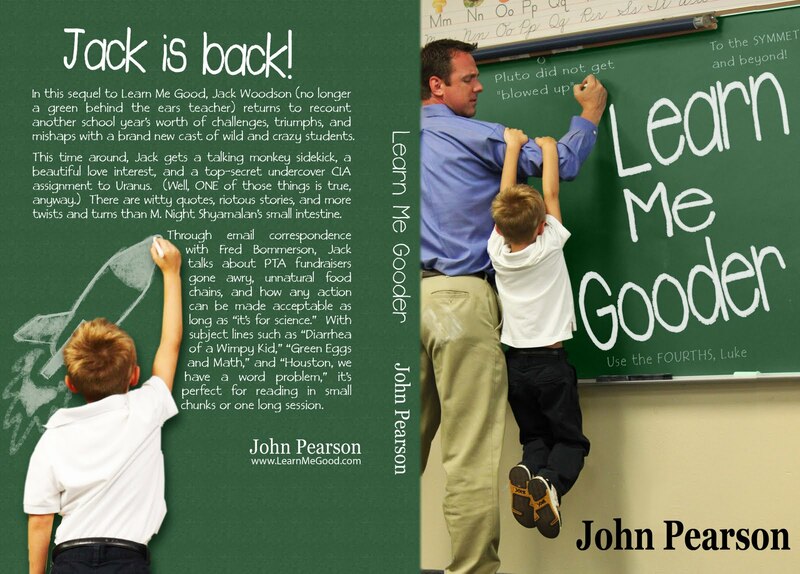 Learn Me Gooder chronicles another year in the classroom of "Jack Woodsen" through a series of emails with a former colleague. 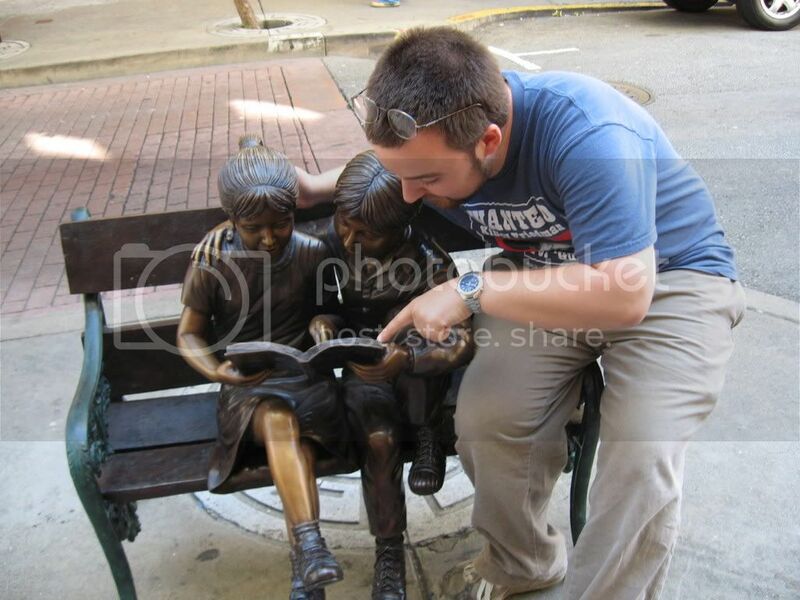 If you've ever read his blog, you know how funny his all-too-familiar classroom stories are. Learn Me Gooder will be available next Monday, 8/22 on Amazon and B&N in both paper and digital format! Adventures with Robots [Philly Teacher] - Experiments with LEGO's robot kits from one of my favorite teachers. This Week in Bots: Learning Bots, Baking Bots, Gesture-Reading Bots [Fast Company] - FC has a weekly column on interesting (and usually fun) advances and uses for robotics. The embedded videos could serve as an attention grabber at the beginning of a robotics project/lesson. FIRST Robotics Competition - Visit the official page to find out if there's a competition near you and how to get your kids involved. Is It Better to Provide Health Food or to Eliminate Junk Food? [GOOD] - GOOD focuses on health, and children's health in particular, very frequently. 19 Fast Food Chains Say They'll Offer Healthier Kids' Meals [The Consumerist] - The Consumerist also covers a lot of public health and related food issues, and is worth following if you're interested in this topic. The Organ Wise Guys - This is a great source of content and resources for teaching young children about health. Using animation and clever characters, it's engaging and easy for kids to pick up. I passed along review materials sent to me by the company to a friend who was doing health lessons with kindergarten students; she raved about how well it worked and asked for more! There's even a version for parents to use at home! Check it out. 300-plus pound student exercised in secret [CNN.com] - An inspirational story. You'll need: a deck of cards for each group of 2-4 players, the DIY graphic organizer seen above, and paper for each student to write down (and double check) every simple number sentence that's created. As with many of the other games I've shared, black cards represent positive integers and red cards represent negatives. Aces are ones and all other face cards are tens. Each player gets 7 cards. The remaining cards are a draw pile. 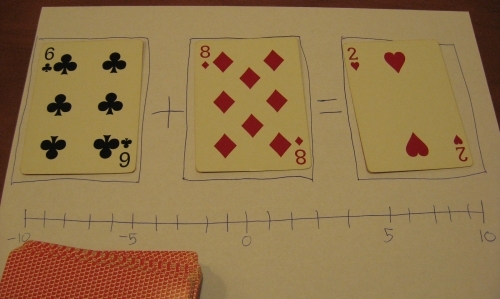 For all subsequent turns, players can replace one, two or all three cards to create a correct number sentence. They should stack the cards on top of each other (so there's always three showing). As in Uno, each player must put down at least one card per turn. If they can't do so with the cards in their hand, they have to draw cards until they can put down something. The objective is to be the first player to get rid of all of your cards. One card: Replace just the -8 with my own -8. Two cards: Replace the 6 and -8 with -6 and 4, which still equals -2. I could also leave the 6, replace the -8 with 4, and the -2 with 10 (6 + 4 = 10). As they play, students should write down every number sentence that's made, and should be encouraged to police each other closely (with your help, of course). Every group will have had different practice, and can proceed at their own speed. That would make this quality independent practice for your lesson on this concept. Designate a wild card. I'd leave aces as ones and use one of the other face cards. Assign other values to face cards. See last week's card game idea, Summy, for more. Change the game to subtraction. This adds a significant layer of difficulty (as I found out when testing this idea out) and could make each game much longer. Give each player more cards. I tested this out and estimate that one game should take about 5-10 minutes using the default 7 cards. I don't recommend using less cards, since it reduces the practice your kids would get, but you could give each player 10 cards instead. If you run out of cards in the draw pile, take all of the stacked cards except the top ones. Shuffle them and put them in a draw pile. How might you use this in your classroom (or with your kids at home)? What adaptations might you make to improve this idea? Share your ideas and feedback in the comments. This is a guest post by Barbara Gruener, who has been a teacher and counselor over the course of her 27 years in education. Check out her blog: The Corner on Character. I love Will Rogers’ adage, “Even when you’re on the right track, you’ll get run over if you just sit there.” It’s funny, but it’s also very true. His point? Get moving! Infusing meaningful movement into your students’ day is a motivating way to engage brain-wave activity and increase productivity. Professor and author John Medina wrote all about it in his book Brain Rules: 12 Principles for Surviving and Thriving at Work, Home, and School. “Physical activity,” he claims, “is cognitive candy.” Because exercise boosts brainpower, students simply have to move to maximize their cognition. Dr. Medina actually suggests moving every six minutes or so. How does that compare with the amount of movement your students are currently getting? After reading that exercise can actually trigger the tiny protein known as brain-derived neurotrophic factor (BDNF) and act “like Miracle-Gro for the brain,” I started walking the track with the students who request counseling sessions. Because movement actually aids in executive functioning like concentration, impulse control, foresight, and problem solving, my students’ minds open up and possibilities become realities. Dr. John Ratey, author of the Spark: The Revolutionary New Science of Exercise and the Brain puts it this way, “To improve our brains, we have to move our bodies. . . . Exercise, involving a series of complex movements while coordinating one’s balance, has been proven to generate a greater number of connections between neurons. These connections make it easier for children of all ages to learn.” That’s why I make it a practice to seal the deal on my guidance lessons with a song and a dance. We end each session with some version of a dance like the hand jive, the chicken dance, and the bunny hop; on the rare occasion that I don’t have any movement planned, my students miss it and ask for it specifically. At my son’s junior high, they’ve actually got an exercise room with 60 stationary spin bikes and many more exercise balls to give students opportunities throughout the day to fire their dendrites. Moving to upbeat music can also elevate and stabilize your students’ moods. I’ve seen it time and time again in my Sing, Dance, Laugh and Build Character workshops. Many-a-tired audience member has been brought back to life when I crank up a song like Rose Falcon’s Up, Up, Up or Captain Music’s Dalmatian Disco and we start dancing. Words can’t explain how energized participants are when we move to the German song So a schöner Tag (Fliegerlied). Look it up on YouTube and you’ll see why! Spirits are naturally lifted when we move to the beat of such happy music! Yoga can also do the trick. This combination of a science and an art helps students coordinate the movement of their bodies with their breathing to improve blood oxygen levels and allow higher blood circulation to the brain. Its outcome? Clearer, more concise thoughts; who wouldn’t want that in a student? Use yoga as another avenue through which to engage learners that seem stuck in a rut. Pull out your favorite yoga stretches and be inspired. Let students pick their favorites and take turns leading. I picked up a copy of The ABCs of Yoga for Kids by Teresa Anne Power this past spring and am eager to try some of the 56 kid-friendly poses designed to promote flexibility, strength, and coordination for when my students need a movement break. Finally, the folks at Special Olympics have designed a cool campaign to engage kids and get them moving with their Get Into It curriculum. The free resource, available at www.specialolympics.com/getintoit, offers activities, videos, athlete stories, and supplemental materials to help teachers educate, motivate, and activate their students. Their lesson plans connect to state standards to provide critical curricular connections with a service-learning emphasis. How might more movement motivate your students and influence their engagement and productivity? For more about engaging the brain with movement, check out my earlier posts Engage Students in a Minute with Brain Breaks and the follow up Teachers Share Their Best Brain Breaks.